Meet Jeff Berkes, our June 2018 #DryTortugas Photo Contest winner. We had the chance to ask him a few questions about his experience at the Dry Tortugas National Park. Read on to learn how he captured his amazing photo! I arrived via the Yankee Freedom Ferry in mid-April 2018 with hopes to view and photograph the annual Lyrid Meteor Shower. The trip was awesome as usual, staff was friendly and helpful, food is good and the waters were smooth that day. It was my 4th trip on the Yankee Freedom to camp at Dry Tortugas, so you know it's awesome! I used the Nikon D4 and the Nikon 17-35mm f/2.8 lens. I also had a sturdy tripod and a "Lightning Trigger" mounted to the hot shoe of my camera. What is a Lightning Trigger?? My "girlfriend", now wife of 8 years, bought it for me in 2001 before a road trip out west (she's the best). The lightning trigger is extremely sensitive to light flashes... It would work the same with a camera flash too. Once the sensor detects a light change it trips the shutter to take the photo. Lightning bolts are typically a series of multiple strikes in one spot. The camera will typically catch the "return strikes" if you have the correct exposure set. I also had a 2 spot ND Grad filter over the sky to darken it a bit while leaving the water bright and colorful. I used a slower shutter speed to capture this image (0.3sec at f/20, ISO 200). When photographing daytime lightning, I like to keep the shutter speed below 1/30 of a second. Most of my daytime lightning shots are around 1/10sec exposure. I do not need the trigger at night since I can already obtain long exposures while the Sun is down. I have been inspired by severe weather since I was a young boy, it's always on my mind. There was only 1 day out of 7 in the forecast that had a chance of storms during my stay in Key West and Dry Tortugas, so I brought the trigger with me just in case... I am glad I did too! The number 4 has always been a lucky number for me. It was my 4th trip there so I knew it would be one to remember and it sure was. I saw tons of meteors there every night, the milky way shines like the Moon, bioluminescent plankton twinkled in the water like the stars, and a strong cold front with 65 mph winds and lightning tore through our campsite one evening. A ranger said it was the first rain they had in 2 months. I always say storms follow me wherever I go... and it held true here once again. It's hard to stay the most memorable moment, I have way to many to choose from as you can see! Each visit reveals a new beauty, that is why I love it here so much. I plan travel to multiple National Parks every year so this pass will be put to good use! 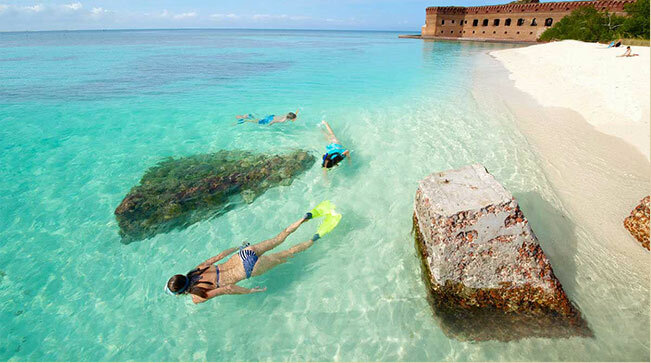 Within the next year I will be visiting Dry Tortugas AGAIN! Cape Hatteras National Seashore, Assateague Island National Seashore, Apostle Islands National Lakeshore, Arches National Park, Death Valley National Park, Canyonlands National Park, Shenandoah National Park and hopefully a few more!